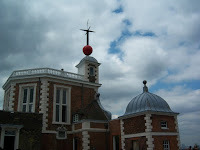 Today we took a trip across Blackheath and through the Park to the Royal Observatory at Greenwich. Our original destination was the Planetarium, which we never got around to in the event, but the Observatory itself is a worthwhile day out... and even better, free entry! We started by getting a bus from Charlton to the edge of Blackheath from where we walked to the top entrance of Greenwich Park. 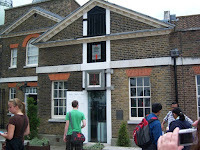 We walked along the beautiful tree lined avenue and finally reached our destination of the Royal Observatory. Standing in front of the Observatory there are amazing views over the Thames towards Greenwich, Woolwich and Canary Wharf. Panorama from in front of the Observatory. There are some amazing exhibitions to see at the Observatory; the original home of the Astronomer Royal has been recreated, including the stunning Octagon Room. There are numerous examples of clocks and watches as well as other equipment used to watch the universe. Amongst other things to see was the amazingly impressive 28 inch telescope. Not for the fainthearted this one as it involved a climb up a very precarious feeling spiral staircase, a walk across a rather narrow terrace and a descent down another long spiral staircase with chequer-plate treads which mean you can see all the way down! A quick stop in the courtyard to admire the Greenwich Meridian (and the plaques to the three previous meridians!) and we moved on to the 'space' side of the exhibits. These were great fun (if probably more aimed at the younger visitors!) and ended with an excellent short film. The famous 'ball' which drops at 1pm every day - we missed it by 15 minutes! 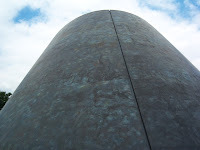 The top of the Planetarium which is constructed using significant angles relative to the Greenwich Meridian and astronomical features! It is made out of copper, and has signs warning against touching as the metal becomes hot in the sun. The airship (again) which seemed to be following us as we saw it on Blackheath, at the Observatory and again when we were nearly home!